Part 4: New Diversions & Dams in the Alpine Lakes Wilderness? Alpine Lakes Wilderness region where automation and new storage is proposed. 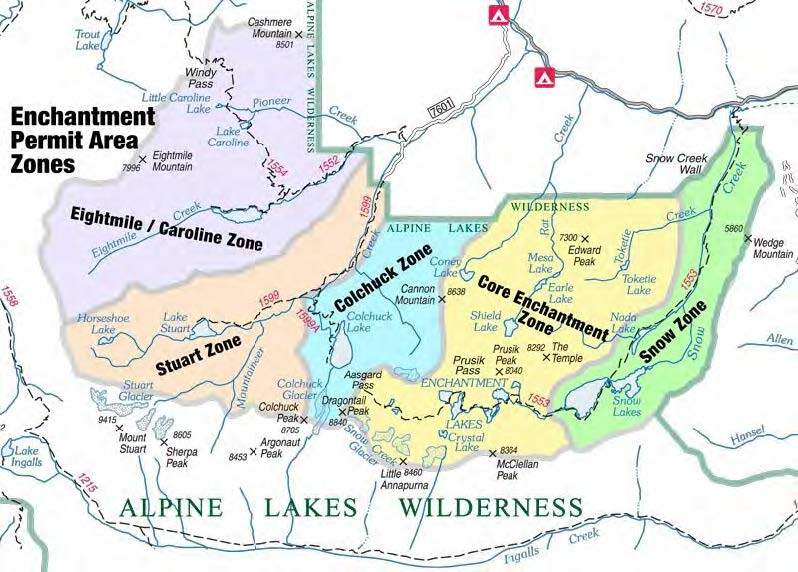 This is the fourth of a four-part series regarding proposals to re-build a dam and increase water diversions from as many as seven lakes in the Enchantment Lakes region of the Alpine Lakes Wilderness. Part 1 describes the genesis and functioning of the Icicle Work Group, the entity which is proposing the water projects. Part 2 examines the Eightmile Lake Restoration-storage project, and Part 3 examines the Upper Klonaqua Lake Pipeline proposal. This article discusses the proposal to automate existing diversions from the Alpine Lakes to increase efficiency and potentially drain the lakes. The IPID and Hatchery diversion methods are primitive: drain holes and gates at the lakes are manually opened and closed at the beginning and end of the irrigation season by IPID and Hatchery staff who hike into the Wilderness. 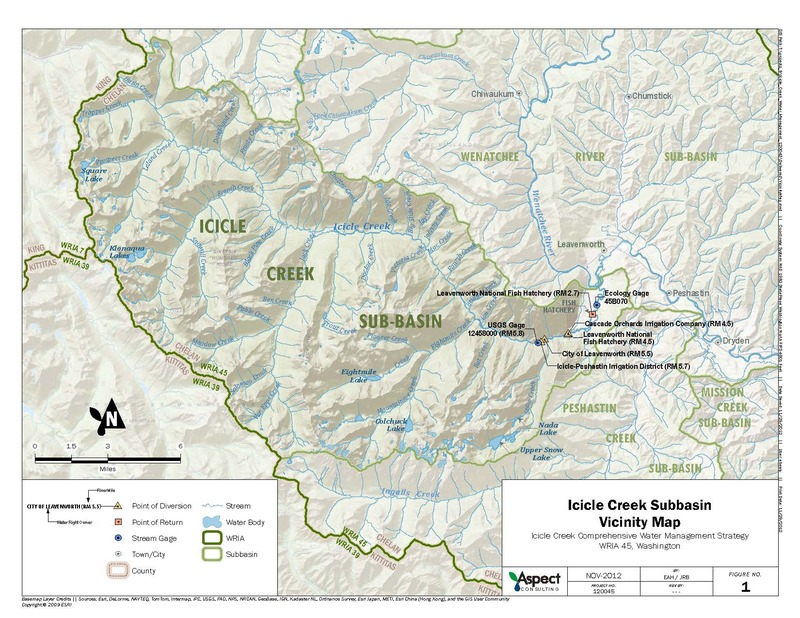 Icicle Creek Subbasin Vicinity Map (Aspect Consulting Nov. 2012). This map shows lakes proposed for storage and added diversions, and existing diversion points on Icicle Creek. The Alpine Lakes Automation/Optimization Appraisal Study (A/O Study) evaluates the potential to install telemetry equipment at each of the seven lakes to allow IPID and the Hatchery to remotely control the water release structures from their offices. Rather than uncontrolled drainage, automation would allow the water users to fine tune the quantities of water they remove from the lakes to meet both consumptive use and instream flow requirements. The original concept for the study was to evaluate more efficient use of water and refill rates. However, the scope of the A/O Study has expanded to include analysis of increasing storage at Snow and Eightmile Lakes. The study evaluates increasing storage at Upper & Lower Snow Lakes by 5 feet and drawing down Lower Snow by an additional 3 feet. The study also evaluates two options at Eightmile Lake. The first involves rebuilding the dam to its original height (adding 4 feet to current pool); the second adds another 1 foot above that. Both options also evaluate lowering the Eightmile Lake outlet by 19 to 22 feet below current drawdown levels. The proposals to install automation equipment, manipulate lake levels, and increase diversions from the lakes seem likely to require approvals from the U.S. Forest Service (which manages the Alpine Lakes Wilderness) and the Department of Ecology (which manages water rights). To date neither agency has indicated their positions regarding these proposals, although as discussed in Part 1 of this series, Ecology’s Office of the Columbia River has provided substantial funding to study new dams and diversions from the Enchantment Lakes. Categories: Icicle Creek, Instream Flows, Salmon, Western Water Law, Wilderness | Permalink.